Unmistakable in its design lucidity and applied technology, the RSV4 is conceived around a 65° V4 engine never before seen on a factory sport bike, a framewhich is the heir to a dynasty that has won 18 titles and 143 Grand Prix races in the 250 GP class, enhanced by the most modern applied electronics systems to manage the engine and the bike’s dynamic performance. This is a true vocation of Aprilia, which was the first manufacturer to adopt the Ride-By-Wire multimap accelerator as standard equipment, but above all the first to patent the APRC dynamic control system, with the exclusive features of self-calibration and wheelie control, in the spirit of maximum effectiveness at the service of top performance. 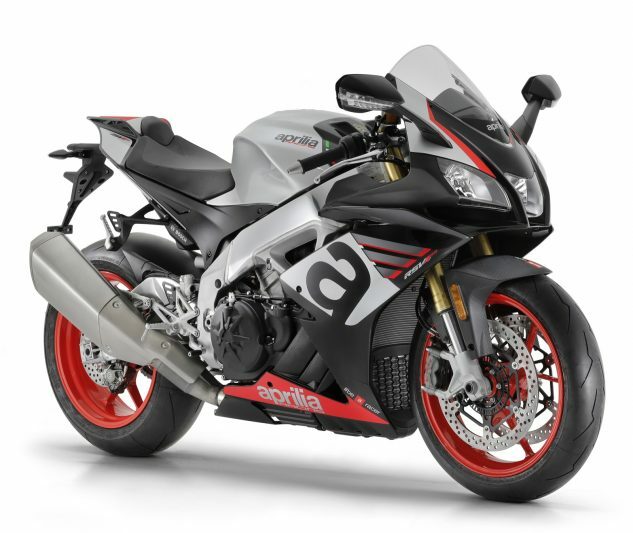 In line with the exclusivity of this model, the Aprilia Style Centre has worked hard to make the RSV4 1100 Factory unique and recognizable even by its colors and attention to detail. The color combinations aim to enhance the exclusive nature of prestigious materials such as carbon (on the front mudguard, the side panels, the exhaust terminal guard and the aerodynamic winglets), in contrast with the titanium finish of the street-legal Akrapovic exhaust terminal, the same color as the forged aluminum wheels. 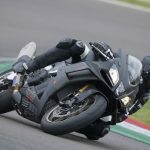 For the graphics of the superstructure, an attractive total matt black look was chosen that enhances all the beauty of the sculpture-like twin-spar frame and swingarm made of aluminum. Given the incredible performance achieved by RSV4 1100 Factory, for the first time on a factory superbike, Aprilia introduces aerodynamic winglets on the fairing, thanks to the developments made by Aprilia Racing on the RS-GP prototype from which they are derived. The particular shape designed in the wind tunnel and the inclination at which they are mounted take advantage of the downforce of the channeled air to let the winglets increase stability at high speeds, contributing to decreasing the tendency for wheelies coming out of turns and at the same time increasing stability in hard braking. 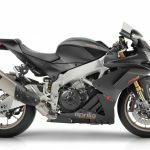 Aprilia RSV4 1000 RR and RSV4 1100 Factory are fitted with an exceptional dynamic controls package designed and patented by Aprilia. 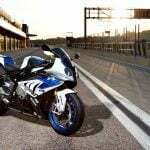 Each one of the two models benefit from a specific calibration of all the controls in line with the different performance levels the two bikes can boast. 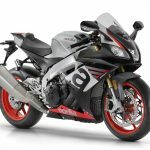 APRC (Aprilia Performance Ride Control) is the well-known dynamic control suite derived directly from the winning technology in world Superbike, one of the most complete and refined currently available on the market. The particular positioning and orientation of the inertial platform that governs the operation of the system allows for optimum possibilities of detecting the bike’s dynamic conditions and, consequently, more effective electronic control strategies. AQS: Aprilia Quick Shift, the electronic gearbox that allows shifting without closing the throttle and without using the clutch, also equipped with thedownshift function, to allow clutchless downshifting. Its open-throttle downshifting feature is exclusive. The color TFT instrumentation is a true digital computer with exceptional display features, now further improved thanks to increased brightness. The two selectable screen pages (Road and Race, both with night and day backlighting) correspond to as many represented indexes. 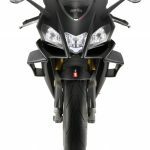 Available as an accessory for both the RSV4 RF and the RSV4 1100 Factory is V4-MP, the Aprilia multimedia platform that lets you connect your smartphone to the vehicle via Bluetooth, introducing for the first time a true corner by corner electronic settings calibration system with data that can subsequently be downloaded to your laptop (or displayed directly on the smartphone) for analysis, just like they do at the races. V4-MP is characterized by a new connection protocol that reduces smartphone battery consumption to a minimum, in addition to providing a wide range of circuits already mapped in which you can manage the electronic settings corner by corner, as well as user acquisition of a new circuit that is not in the list Aprilia has provided. V4-MP also includes the infotainment system, introduced by Aprilia for the first time on the RSV4, to manage voice commands and incoming/outgoing telephone calls with your smartphone. These activities are also displayed and managed by the digital instrumentation. 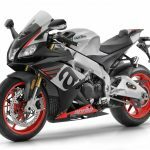 Aprilia RSV4 RR represents a top shelf technical platform, ready to provide the rider with a “race replica” performance and feeling. In order to support the most demanding riders, one of the available accessories Aprilia offers is the Track kit, a package of prestigious parts that work together to improve many aspects of the RSV4 RR such as its weight, handling, aerodynamics and, last but not least, its appearance. 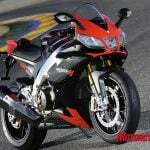 The MY19 version of RSV4 RR has not undergone any technical changes with respect to the previous version. The primary and unique characteristics of this 999.6 cc gem of Italian technology, the ones that led to the creation of the best superbike of all times, are in common with the 1078 cc engine that powers the Factory version. 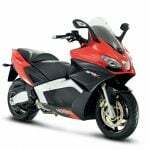 This is the world’s first full scale production motorcycle with a high performance narrow V4 engine, the most revolutionary and powerful engine ever built by Aprilia. An engine that has been made unmistakable because of the use of “total” electronics, because of its extremely compact size and light weight, to which the magnesium external housings, oil sump and cylinder head covers contribute. The narrow V architecture has made it possible to make an engine that is extremely compact lengthways which helps to centralize weights and to have an extremely high-performance chassis. The timing system uses very particular kinematics: the chain camshaft drives only the intake camshaft which in turn drives the exhaust camshaft via a gear. This allows for extremely compact heads, to the advantage of the frame layout which, on the RSV4, is as compact as that of a Grand Prix bike. the crankcase is monobloc with integrated aluminum cylinder liners to ensure maximum rigidity and consistent performance. The countershaft dampens vibrations. Power and maximum torque are respectively 201 HP at 13,000 rpm and 115 Nm at 10,500 rpm; bar-setting values that are joined by the one-of-a-kind sound that has always been the true soundtrack Aprilia V4 engines have always offered. Like the 1100 cc V4 of the Factory, the RR’s 1000 cc also boasts ultra-lightweight pistons fitted with segments that reduce the blow-by effect in order to combine high performance and reliability. There is also a honing treatment for the connecting rod heads that contributes to reducing friction. The valve return springs also guarantee reliability during heavier workloads, while the valves benefit from optimized timing. The gearbox has a linear sensor that guarantees impeccable shifting operation, while the RSV4 RR exhaust system has a silencer fitted with double lambda probe and integrated valve. 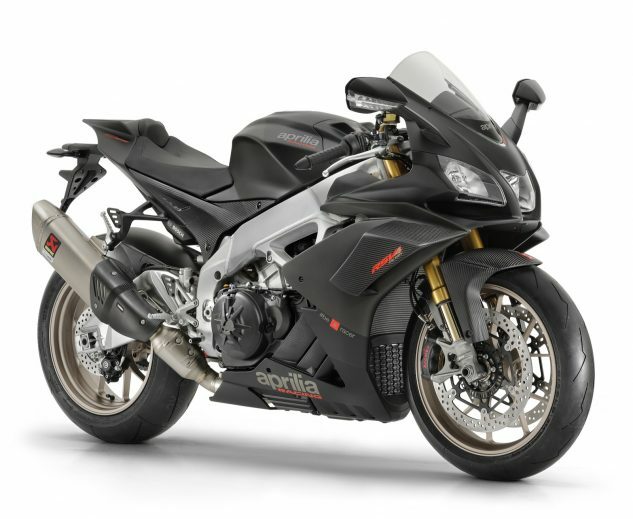 Aprilia RSV4 is the representative par excellence of Aprilia tradition in packaging state of the art chassis architecture, thanks to the know-how acquired in top level world competitions. The frame with exceptional adjustment possibilities and the swingarm exploit pressed and cast elements welded to one another. The ration between torsional stiffness and flexibility is one of the secrets of the RSV4 chassis architecture’s success. 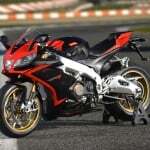 It is the same structure that equips the Aprilia RSV4 1100 Factory, although the latter boasts a different steering geometry. 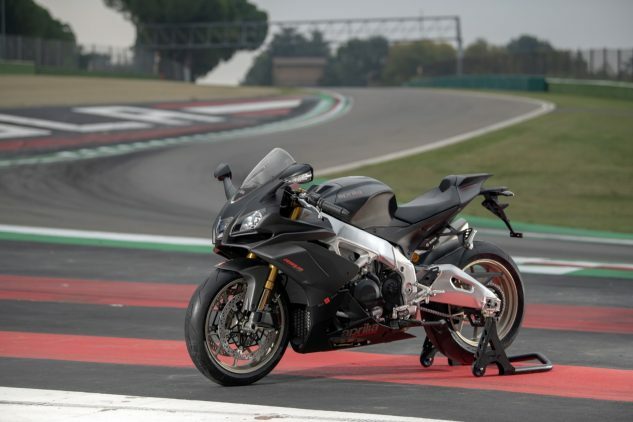 The chassis architecture of the RSV4 RR is completed by a Sachs suspension trio (instead of the Öhlins equipment on the RSV4 1100 Factory), made up of a fork with 43 mm stanchions and a shock absorber with separate “piggy back” and a steering damper, the first two fully adjustable in all hydraulic functions and in spring preload (the shock absorber also has a center-to-center length adjustment that allows the height of the rear end to be changed). 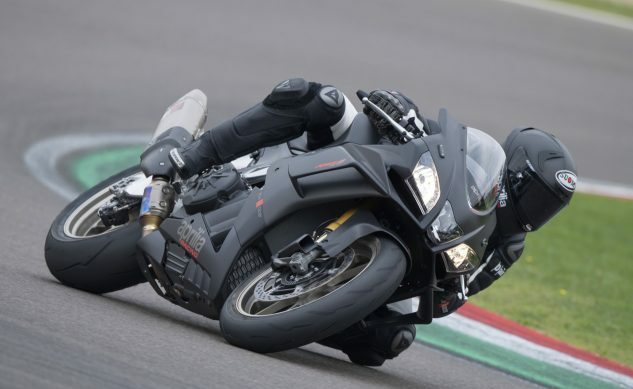 On the RSV4 RR, Aprilia offers a pair of cast aluminum wheels and a Brembo braking system that is the absolute top of the line in this category: the front relies on a pair of new 5 mm thick steel discs with a diameter of 330 mm, gripped by the monobloc M50 calipers fitted with high friction coefficient brake pads. 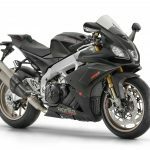 Aprilia RSV4 RR is available in two attractive new color schemes on a black and grey base (Rivazza grey and Arrabbiata black) with red wheel rims. 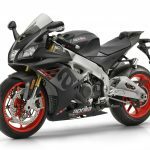 Aprilia RSV4 1100 Factory is the exclusive version that comes standard with latest generation Öhlins suspension systems, lightweight aluminum forged rims and the titanium Akrapovic exhaust terminal. It stands out for its dedicated Atomico 6 graphics which highlight and enhance the use of precious technical materials such as carbon, thanks to the contrast with the total black matt paint. The upper steering yoke enhanced by the laser etched writing ‘1100 Factory’ in contrast completes the features of the new RSV4.